Design: The Sport Tee is made by crew neck on the top. 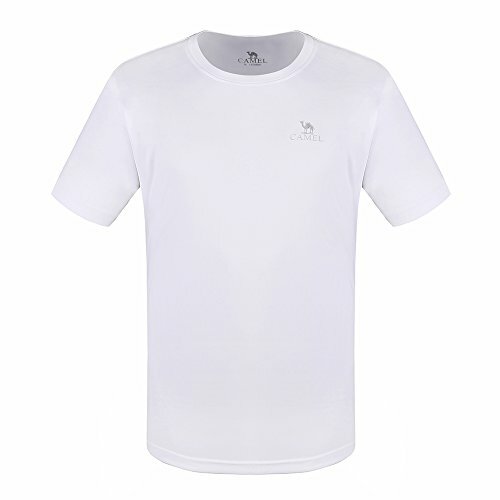 That\'s the simple design as most active round neck T-shirt do. Fresh color always makes the men look younger and fashion. This series fashion T-shirt is new design special for Sports enthusiast. Straight shirt length and the side web cloth can be more breathable when doing the exercise such as running, gym, tennis & basketball. Breathable Material: 100% polyester. with high elasticity, stretchable and ventilation mesh function, which can make you feel cool and comfort when you do some sports in hot weather. Lightweight activewear allow pulling without deformation. The advantage is easy to get dry after washing. Casual comfortable T Shirt: Slim Fit With Some Elasticity, looking handsome while retaining ease of movement and added comfort. White, Blue,Black color. It\'s available for any workout occasion. Occasion: CAMEL Moisture Wicking Athletic Shirts are great for all summer sports, beach, running,football, baseball,soccer, workout or wearing around the house. Machine Washable: Machine wash cold, do not bleach and tumble dry low. Cute but attracted every hidden piece of lint in our dryer. Now its full of fuzz.